The Club sailing facility originated from a mill pond coupled to Gods Port, (later to be called Gosport) creek in the reign of Charles II and is shown on maps from 1678. It was changed into a cockle pond in 1751 and there were few changes up to the 1890’s. Under the shadow and influence of Camper and Nicholson’s yard, famous for J Class yachts, the cockle pond was renovated under the Unemployment Work Programme in 1926, specifically for model yachting and to accommodate Gosport Model Yacht Club. 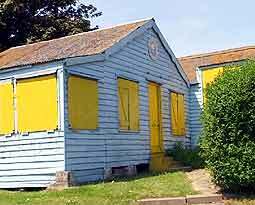 Model yacht sailing has taken place at Gosport since the late 1890s with the Club House and Boat Shed being built by the members in the latter part of the 1920s. 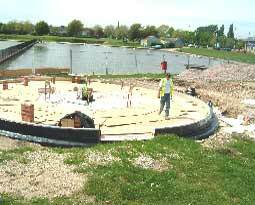 In 1926 the original Club House was built by our members and this year it is being replaced adjacent to the two ponds with a new purpose built Club House and boat store, on top of which there will be a cafe/restaurant with balcony overlooking the lakes, so it will be well settled in for 2005. Free, Vane and Baine steering yacht racing has continued at Gosport since the early 1900s. The first radio controlled yachts were seen at Gosport in the early 1970’s, with the first World Championships for Marblehead’s, RM’s and 10 Raters in 1975. The lakes at Walpole Park are unique having a flat concrete path on all sides; the large lake in the photograph at the top of the page is 230 metres long and 54 metres wide the smaller one being 110 metres long and 55metres wide holding approximately 3.5 million gallons or 15000 Tons of salt water in total. The adjacent parking provides ideal access and the only similar lake in the UK is at Fleetwood, Lancs. With recreational pursuits expanding to suit additional free time, it is hoped that many new members will be welcomed to our Club and it will continue to prosper, with the ongoing co-operation of the Gosport Council, throughout the 21st Century. We have typically a membership of 60 who sail One metre, Marblehead, A Class, 10 Rater both Vane and Radio with a new Scale section developing. The members range in age from 10 to 80 years old, both sexes and the sport is suitable for all levels of physical ability creating useful exercise with copious amounts of fresh air, mind stretching concentration and negligible damage to the environment. Recently there has been a revival in Vane sailing at Gosport with four new A class this year, we even have the Pink Panthers Suzanne Lewis and Jim Jakes, who are a colourful team right down to Jims purpose built pink scooter. The club hold Vane races throughout the year. With both lakes available we can have radiosailing and Vane without any problems and are promoting 1 Metre sailing every Sunday alongside a full sailing schedule for the other classes. 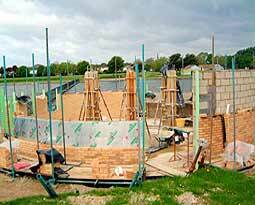 2003 is an important year for the Club with the building of a new pavilion and Club House. Our existing premises are looking a little the worse for wear and this will be an exciting regeneration opportunity and hopefully the return of International events to Gosport. Our events will be integrated with other events taking place in Gosport maximising the benefits of the recent developments along the water-front and Walpole Park. 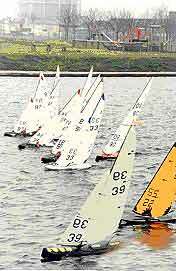 “The year 2005 will be the 30th anniversary of the first RA International Championship held at Gosport in 1975. 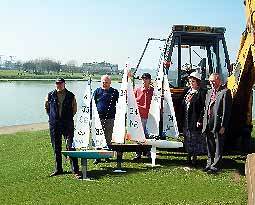 The Lakes at Walpole Park, Gosport have a long history of yacht sailing, ranging from the late 1800's until today. 2005 is an important date for Gosport and Portsmouth, it is the 200th anniversary of the Battle of Trafalgar. Portsmouth, which is just across the river will be holding The International Festival of Sail during 2005 and there will be a Sound and Light Show on the Solent, sometime between the 24th and 29th June, when the Tall Ship Fleet leaves. 'In the nick of time' means, at the critical or precise moment. The expression is about three centuries old, formed when someone added 'of time' to the older expression, 'in the nick', which meant the same thing. A nick is a groove, a notch, as made with a sharp knife when one cuts a 'V' in a stick of wood. It expresses precision more accurately than a notch so formed.